In romantic comedies, the male protagonist often makes an attempt to win back the heart of his lady with an over-the-top gesture that is sure to capture her attention and love. When it comes to mobile businesses attempting to win back the hearts of customers who no longer use their app, a similar gesture must be made — albeit less romantic. 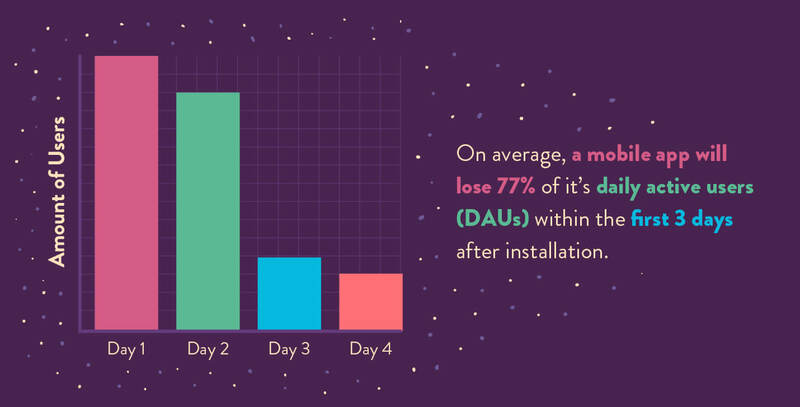 On average, a mobile app will lose 77% of its daily active users (DAU) within the first 3 days after installation. That number continues to increase over time: up to 90% within the first month and over 95% after three months. What is a Win-Back Strategy? A win-back strategy is exactly what it sounds like — a calculated marketing plan to get those DAUs who dropped off back on your app, retain them as active users, and help keep your churn rate low. Churn rate, the percentage of users who stop using an app during a given period, is detrimental to the success of your platform. In order to have a successful app, the number of new users must be higher than the number of users who leave. Not only does churn stifle the growth of your app, but it’s expensive as well. You can think of churn as a leaking bucket: The water is coming out of the bucket faster than you can fill it back up, and the cost of refilling that bucket can be high. It’s still important to put effort into acquiring new users or customers for growth, but it’s equally important to continue adding value to the customers already in your database. Win-back campaigns and strategies are an effective way of reinvigorating your dormant users, helping improve your customer lifetime value. Once you’re able to identify the reason(s) why a customer has stopped using your app or service, you can begin to map out a strategic plan for wooing them back. Executing the proper strategy may not only recapture the attention of your inactive user, but could be the reason they re-engage. These four win-back ideas are proven tactics that can help bring your disengaged customers back on board. 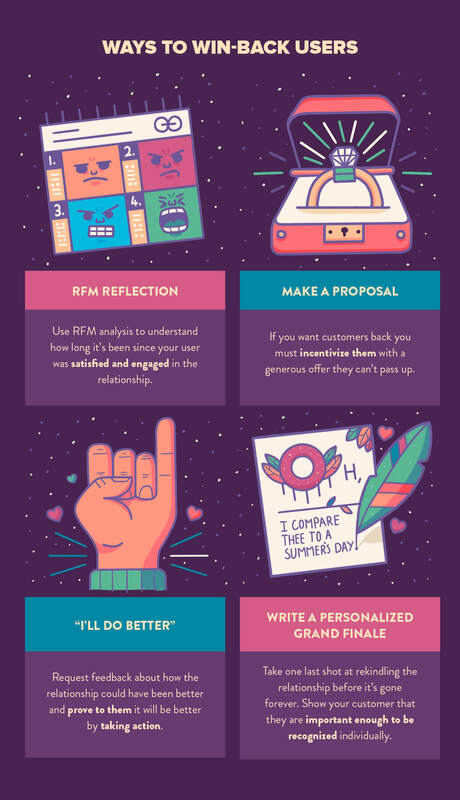 RFM (recency, frequency, monetary) analysis is a marketing model that highlights segments of customer behavior based on their history with your product. These metrics can help you decide which win-back strategies to implement by looking at who your best customers are and which ones contribute to your churn rate. Who are your best and most active users (i.e. your power users)? Who has the potential to become a more valuable customer? Which of your customers are most likely to respond to your win-back tactics? Once these questions are answered, the RFM analysis can help determine which at-risk customers might need to be targeted in a win-back campaign. RFM is also helpful for marketers to gain visibility into who their brand loyalists and champions are, who can be targeted in other campaigns like reward programs and promotions. If you have customers that are either dormant or disengaged within the app itself, two strong options for reaching them are push notifications and email. Tailoring messages specifically to a particular segment with a special offer is a great way to remind them that you’re still there. It’s simple for app developers to personalize push notifications with customer information such as location, or based on their previous transactions. Consumers are more likely to make a purchase if they feel they’re getting a unique or special discount, especially if that offer is only good for a certain number of days. Clearly communicate in your push notification or email how long the offer stands. Customer feedback is important for any company or organization to continue growing and improving. When developing an app, every feature and element will be discussed practically thousands of times by internal teams. Receiving customer feedback can offer new insights about the overall user experience with your product and what can be done to improve it. In-app surveys see an average 13% response rate, which makes them a great tool to capture real-time feedback from active users. Once you’ve gathered information, it’s important to show users that their feedback is valuable. If you choose to implement any suggested changes, let your users know that you’re listening. You can include a message of thanks in your new feature announcements, or take it a step further and send a personalized email to show you appreciate the time they took to provide feedback. Every customer wants to feel like their voice is heard and their opinion matters. With the high cost of acquiring new customers, retaining your existing customer base should absolutely be a business priority. Within email marketing, you can use personalization tactics to let subscribers know you’re paying attention. Include their name in the subject line and within the email body to show them you’re interested in their individual experience. You can also utilize user data and provide tailored offers based on their previous purchasing habits. There is also opportunity to personalize the customer service experience. Provide them with a designated support representative who is available to answer questions and troubleshoot any issues. Offer multiple channels such as phone, live chat, or email to ensure all customers can reach a service representative in a way that is convenient for them. Don’t just take our word for it — win-back strategies are an effective tactic for re-engaging users. Many companies and organizations have seen real success when implementing these strategies. 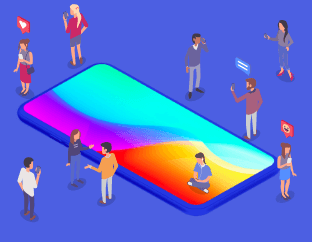 The game deploys a variety of push notifications in an effort to keep daily users coming back and re-engage lapsed or dormant users. Whether it’s alerting users of rare Pokemon that will only be nearby for a limited time, or keeping track of daily battle streaks, these notifications are effective at getting users to open their app. It’s common practice for e-commerce brands to activate win-back strategies for customers who haven’t made a recent purchase. The popular food delivery app Postmates sends weekly emails to their subscribed users with deals and discounts, but sometimes these discounts are carefully planned. In one instance, Postmates sent an email with the subject line, “Your Mystery Discount Is…” In order to receive their discount, users had to click a clearly marked button within the email body to open the app using a deferred link. Daily active users who clicked through received a hefty discount of 75% off their delivery fee, which any customer would be thrilled with. The real jackpot was for inactive users, who would receive 100% off their delivery fee if they clicked through the email. Giving your users generous offers whether they’re active or not, is a great way to keep your engagement (and retention) high. For subscription-based services, win-back emails are an option for earning back lost business. Skillshare, an online learning community with thousands of classes in a variety of subjects, offers a variety of plans. Acquiring new customers is instrumental to the success and growth of your company. Retaining your existing customer base is an equally important effort. Don’t brush off the users who have gone dormant — utilize user data and personalized win-back strategies to re-engage them. We’ve put together a high-level overview of the fundamentals in user retention with tips and suggestions on how to earn loyal users. For more information on how to implement RFM analysis used in customer segmentation, take a look at our guide here.